Panelists at the George Washington University including 'Reading Rainbow' host untangle talking honestly about American slavery. 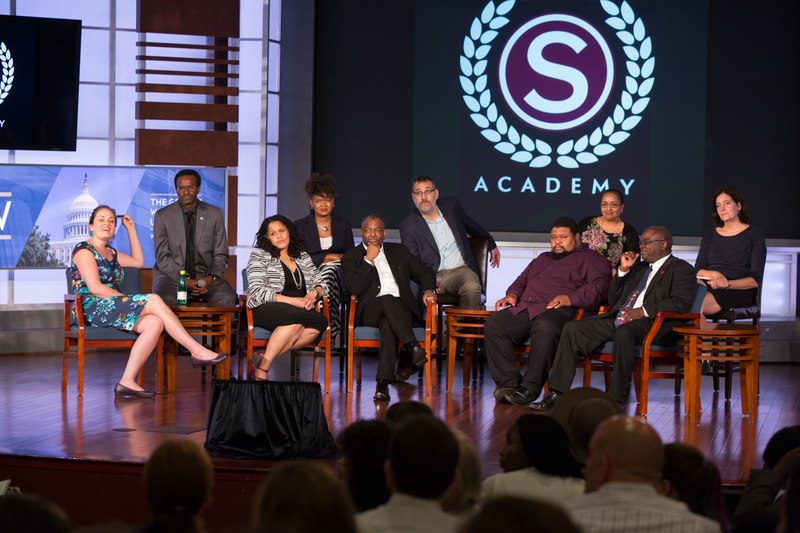 One of the most difficult and fundamental issues in American history was open for discussion at the George Washington University Thursday night, when the Slate Academy held its capstone symposium, “How Do We Get Americans to Talk Honestly About Slavery?” in the Jack Morton Auditorium. The event was divided into five panels, with the first—on experiential learning and the legacy of slavery—moderated by Ms. Onion and featuring Joseph McGill, preservationist and director of the Slave Dwelling Project; Paul Gardullo, curator of the soon-to-open Smithsonian National Museum of African American History and Culture (NMAAHC); Kamau Sadiki, vice president of the National Association of Black Scuba Divers, who with Mr. Gardullo and partners including GW is a director of the Slave Wrecks Project; and Michael W. Twitty of Afroculinaria, a food historian and educator. The second was a presentation by Nancy Bercaw and Mary Elliott, who will co-curate the Slavery and Freedom exhibition within the NMAAHC; the third a discussion on gender and slavery between novelist Dolen Perkins-Valdez, author of Balm and Wench, and Jennifer James, director of GW’s Africana Studies program; and the fourth a conversation between Mr. Bouie and actor, activist and educator LeVar Burton. Finally, all nine panelists reconvened to take questions from the audience. 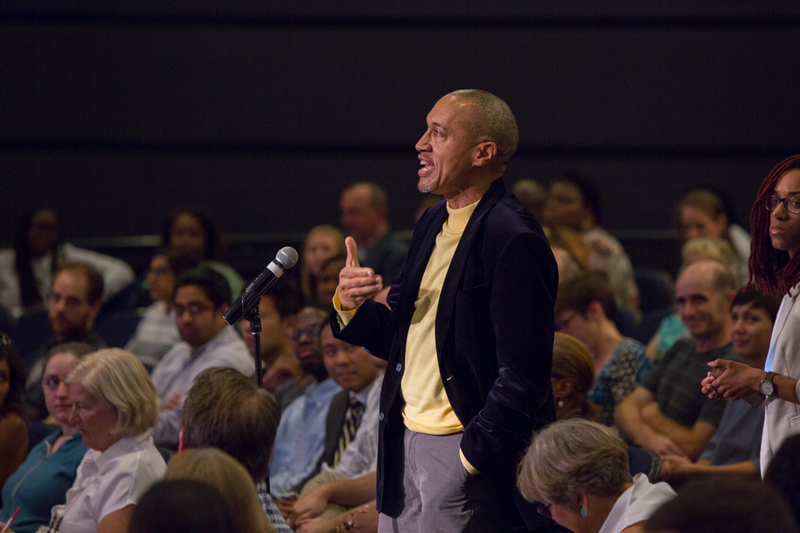 For panelists and audience alike, the discussion was as much personal as historical. Audience members who asked questions included descendants of Roots subject Kunta Kinte and of George Stinney Jr., the youngest person ever to be executed in the United States. Dr. James discussed her family’s complicated relationship with Andrew Jackson, who owned some of her relatives. Slavery is “the original sin that America has never atoned for and has never recovered from,” said Mr. Burton, who added that remnants of the institution are still visible in issues such as police brutality and U.S. corrections policy. Yet it is nearly impossible to discuss slavery in the United States without provoking defensiveness from non-black Americans and too often silence from descendants of the enslaved, panelists said. Every panelist agreed that there is one way to make slavery’s legacy visible: humanizing those who were part of it. White and black audiences alike, they said, need what Mr. Burton called “an emotional entryway” to a subject as vast and ugly as slavery. For Mr. Twitty, that entryway is food. For Mr. McGill, it is the spaces in which enslaved people lived. For Mr. Sadiki, it is the remains of the ships that brought them to America. Dr. Bercaw and Ms. Elliott cited the permanence and tangibility of objects as one way to bring enslaved individuals alive to a modern audience. The NMAAHC’s collection will focus on human stories, using everyday personal items to illuminate enslaved life. For Dr. James and Ms. Perkins-Valdez, who “both traffic in the idea of the imaginary,” as Dr. James said, fiction is one powerful way to humanize a historical atrocity. This is particularly true, they said, when it comes to the stories of enslaved women, vanishingly few of whom left behind records of their own lives. “I want to make sure that when we talk about ‘honest’ conversations, that ‘honesty’ includes the stories of women,” Ms. Perkins-Valdez said. Finally, Mr. Burton, perhaps best known for hosting and producing public television show Reading Rainbow and for his star turns in Roots and Star Trek: The New Generation, discussed the importance of representation, of education and of narrative. Mr. Burton, who is remaking Roots as a new miniseries, said the information age offers an opportunity to repair the narrative around slavery.